I have been following the debate around the opening of the new Jack the Ripper Museum at 12 Cable Street, London both on the Museum Association’s LinkedIn pages, and also via the press who have interviewed irate support groups and local communities. Yet I can’t help reflecting that the man at the root of it all – Mark Palmer-Edgecumbe – will be all too familiar with the fact that “bad publicity is good publicity”; his new venture has certainly hit the headlines in a way which would have otherwise cost a fortune to organise, and this morning the website viewing figures were at 17,973. If he can weather this big storm (and I understand the opening of the museum has been delayed) he may well have a viable business to take forward. So I consider, as I sit at my desk on this rainy Tuesday morning, whether some of this public outcry is around the discomfort of admitting that “Ripperology” is big money – a fact which has surely not gone over Mr Palmer-Edgecumbe’s head. Not far from the new museum Jack the Ripper Tours advertise their latest technology: “the gruesome tale of Jack the Ripper explodes for the first time into the 21st century … WITH RIPPER-VISION“. 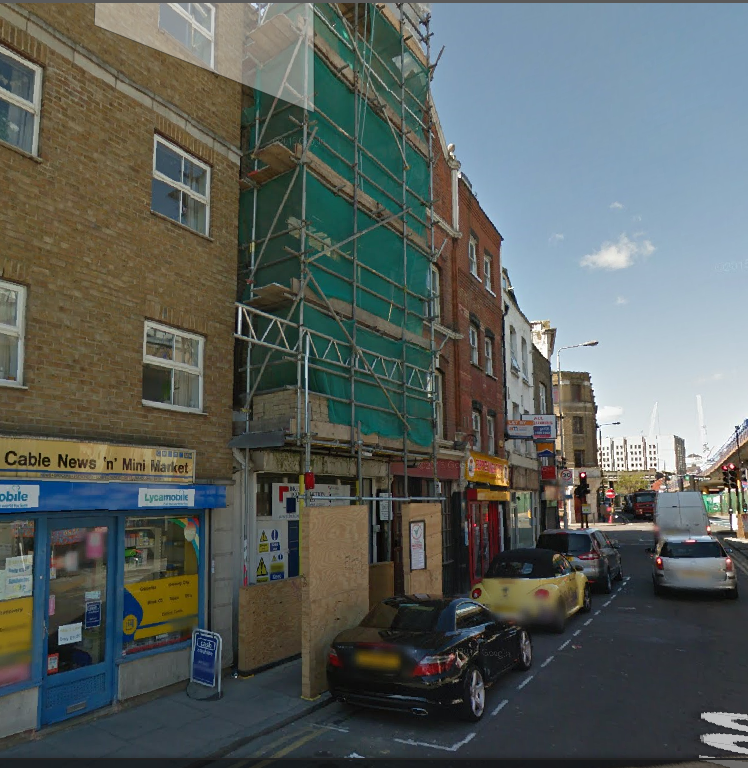 12 Cable Street was marketed at £500,000 as an excellent development opportunity. Even with a total boycott from the local community and world of museums, at £12.00 entry fee and the online Ripper shop they may achieve a healthy profit by targeting the niche dark tourism sites and the curious tourists who crave a London of pea soup fogs and Sherlock Holmes murders. And who am I to point a finger here – all heritage attractions are now chained to “sustainability” and business planning. 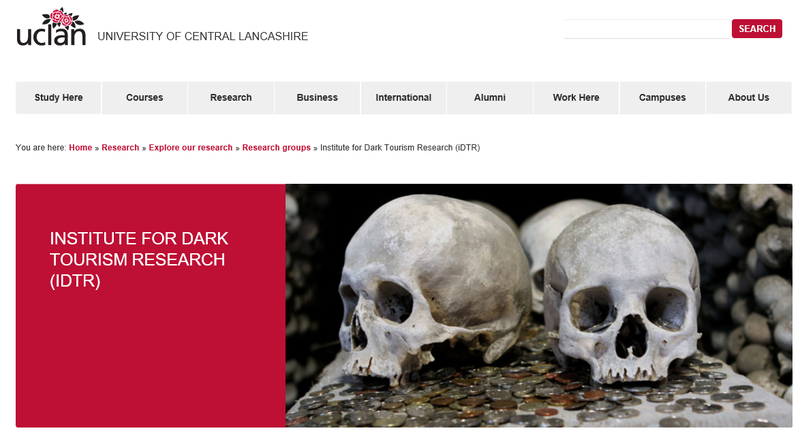 In academia dark tourism and histories have been widely researched, but where academics may venture in, museums or heritage attractions need to tread a fine line between “good” and “bad” taste and address the hard to define issues of decency, respect and ethics. Indeed, Paul Mullins comments in his post on Archaeology and Material Culture website that “the Jack the Ripper Museum is firmly situated in this ambiguous tension between measured museum scholarship and tourist trap sensationalism”. Having worked as a curator for a police museum for over 10 years, acted as Arts Council England mentor for another police museum, as well as currently sitting on the committee of the Crime and Punishment Collections Network and researching an AHRC-funded PhD examining police collections, I constantly skirt around the boundaries of dark tourism and contested histories. I am used to the fact that murder creates huge interest, whether from the salacious, the writers and readers of true crime or the historians of criminology; and I am equally aware of the sensitivities and ethics of holding artefacts and files which record sudden deaths in violent and often unexplained circumstances, in respecting the voices of the dead and, for more recent murder cases, the wishes of the families. Often police files, forensic evidence and morgue photographs are all that the victims’ families have left. Murder wreaks havoc through families for generations and I have occasionally had to work with relatives or descendants trying to piece together the guilt, the sorrow and the silence. Police, Prison and Court Museums are dotted around the country displaying artefacts and historic archives for the organisations they represent. Indeed 30 minutes walk away is the City of London Police Museum which holds its own collection relating to Jack the Ripper including photographs and information about the investigation and also – though much less publicised – the Houndsditch Murders of 1910 which led to the Siege of Sidney Street (there is a post about it on The History Student’s blog). You won’t find portrayals of the dripping blood of women at this modest museum because it’s all to do with professionalism and public money. 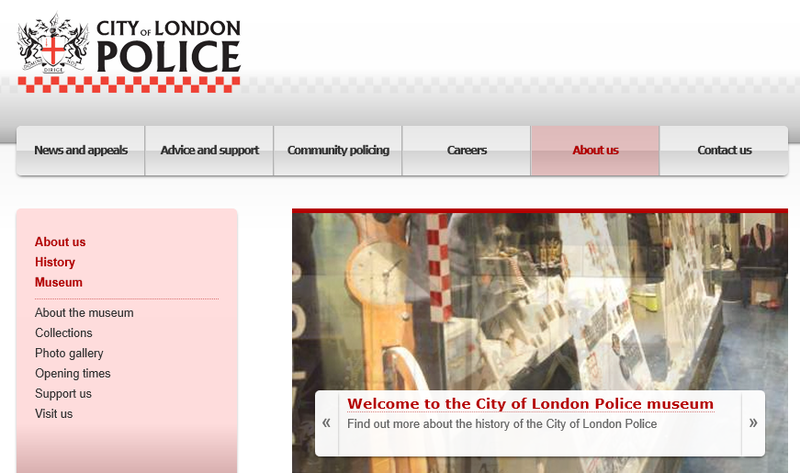 With first hand experience of interpreting police collections, I believe the Museum of London will pull this off. They have access to the necessary expertise and resources, as well as a wealth of experience in displaying archaeological remains and burial sites. So how has someone with Mark Palmer-Edgecumbe’s pedigree apparently got it so wrong? Especially as it seems (according to an article in The Londonist who interviewed him on 31st July 2015) he was a Governor at the Museum of London from 2005 to 2013, Chairman of the Museum of London Docklands from 2006 to 2009 and former Head of Diversity and Inclusion for Google in the UK, Middle East and Africa. In addition (again according to The Londonist) Dr Cathy Ross, author and honorary research fellow at The Museum of London, acted as curatorial consultant and wrote a guide book. There seems to be a chronic lack of transparency and like some dark magician Mr Palmer-Edgecumbe appears to have duped his entire audience into believing this was going to be a museum for women’s history and no-one was any the wiser until the scaffolding and hoardings were taken down to reveal all. Building Design Online interviewed Andrew Waugh of Waugh Thistle Architects who were commissioned by Mr Palmer-Edgecumbe to undertake the complex task of turning the narrow and cramped town house at 12 Cable Street into a fully functioning museum. Mr Waugh is another individual who feels duped over the project and that he wouldn’t have touched it with a barge pole had he known the eventual outcomes. He described how he was persuaded that the project had no money: “this was a real heart-felt project. It is incredibly important to celebrate women in politics in the East End. We really ran with it … we did it at a bargain-basement fee …. we submitted it for planning and never heard another thing … when we heard it was going to be turned into a Jack the Ripper Museum we contacted the owner but got nothing back, we heard nothing.” And so the façade adorns Cable Street complete with dripping blood, skull-and-cross-bones and fake English Heritage blue plaques commemorating suspected culprit George Chapman and the fourth victim, Elizabeth Stride. 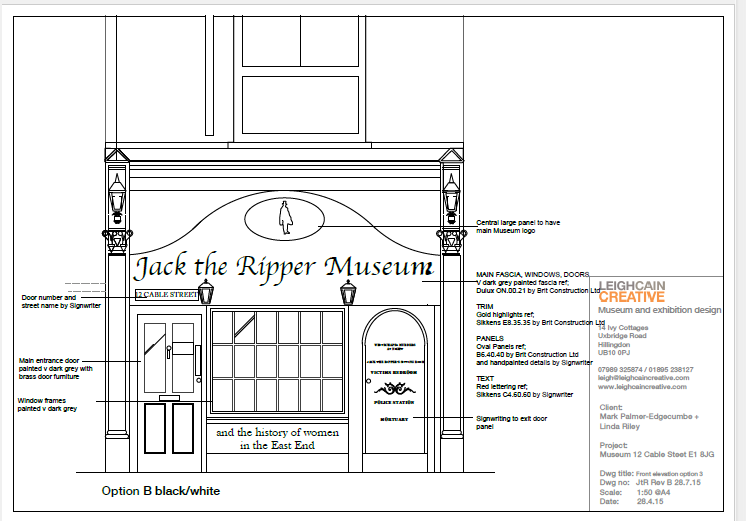 A rushed retrospective planning consent application (see the image at the bottom of this page) to make good and appease his critics now includes signage for “Jack the Ripper Museum and the History of Women in the East End” – how can the two even sit side by side? And so Mr Palmer-Edgecumbe digs himself yet deeper into this tangled, duplicitous and contradictory venture. He may well have been inspired by The Sherlock Holmes Museum in Baker Street; a strange phenomenon in that many visitors truly believe it is a real place – a 3-dimensional site where fantasy is acted out. And this must also be a relevant and critical concern for any serious curator of The Jack the Ripper Museum. As has been pointed out by so many, it isn’t a ripping murder mystery but a grim sequence of events relating to deaths, women’s rights, poverty, violence and urban decay which sliced through the community at the time and continues to slice through the contemporary, rapidly evolving communities who are keen to celebrate all aspects of their rich heritage and contested histories “beyond” Jack the Ripper. It does seem, according to the media at least, that there is not just anger, but also a real tiredness around the relentless exploitation of this part of London; for example, The Guardian’s “How the Jack the Ripper industry distorts London’s East End” and the Independent’s “Are Jack the Ripper tours blighting London?“. I suspect much of this has to do with the rapid gentrification of these areas and that Mr Palmer-Edgecumbe’s venture is simply the straw that broke the camel’s back. As more savvy and settled middle-class communities move in and replace the traditionally transient populations there will be more and more raised voices about the environment in which they live. My final thoughts before I close this post are – I just can’t help feeling, like any good trick, that there must have been more going on behind the scenes than certainly I am led to believe. Surely any heritage project which involves a number of interested parties should be allowing access not only to the physical site but to the changing vision – because visions are amorphous by their nature. And with this in mind, I would like to know whether the press, or anyone, has been given a private viewing of the completed interior so that we can all at least make an informed judgement about the “book” rather than just the “cover”. It makes me wonder whether Dr Cathy Ross has made a valiant attempt to interpret a poisoned chalice of a project, and the disastrous facade was left to the whims of Mr Palmer-Edgecumbe. Thank you for taking the time to read this post. I enjoyed writing it – I hope you enjoyed reading it. Please comment, share or like.